This weekend I met with a good friend of mine who decided to take a weekend vacation to Austin. It was a good time to catch up on how life has been going since we last had seen each other several years ago. We reminisced about the good times we had in medical school. Since he is also a new attending the discussion arose as to how life naturally changed with an increase in pay. It’s inevitable that when salaries increase from $50,000 to > $250,000 per year there will be some changes that need to occur. Below will be some of the changes that new attendings should go through financially upon starting their job. This should be mentioned first since emergencies happen and there needs to be a plan in place. During residency, saving up a six month emergency fund is often not possible. The cost to move to a new city, a deposit for an apartment, and student loans coming due all create a financial situation where it very difficult to have a 6 month emergency fund intern or PGY-2 year. I tried to save up for an emergency fund by the time I graduated but it was not enough and ran out of money. There are many potential delays while practicing medicine and time off from work can mean a huge financial hit to ones budget. One of the first things new attendings should do is to make sure that a six month emergency fund is in place for their new budget, not the resident budget. Saving for an emergency fund was one of the first things I did after receiving my paychecks. Depending on tax filing status (single vs married and employee vs independent contractor) there may be additional unforeseen taxes. In the first year after graduating, be sure to set aside some money in the event that there are additional taxes owed. I have about $5,000 put away in the event that I have to pay additional taxes come April. Independent contractors will have to put much more aside in order to prepare for taxes. My friend who is working as an independent contractor saves about 40% of his pay for when taxes come due. These savings should be in addition to an emergency fund. The emergency fund is not for emergency taxes. It was not long ago that I had a cardboard box as my nightstand. Once the larger paychecks started rolling in, it would have been easy to go out and buy very expensive furniture that I thought I deserved. Instead, I bought one off of amazon or $40. It takes active participation to stay mindful of financial goals and to avoid lifestyle inflation. The $100 spent at a restaurant seems like a low percent of an attending physicians income but is still a lot of money by most people’s metrics. Stay mindful of habits and creeping lifestyle inflation. In college and medical school there was always the feeling of this will be paid off one day when I’m a practicing physician. Well, one day has arrived and its time to get serious about being debt free. It’s not glamorous using a large chunk of the paycheck to dig out of debt but it has to be done. The stress of seeing the loans hanging over my head for almost a decade now has an active method for its inevitable defeat. No need to put off debt to avoid reality. Many new doctors have a negative net worth and need to climb out as quickly as possible. In a perfect situation the large paychecks would never stop being deposited into a bank account. If a physicians stream of income were to ever dry up or be in jeopardy then there could be some serious financial consequences. Soon after becoming an attending most physicians look into disability insurance to protect their family in the event that they were unable to work. No one wants to put their significant other in the position of looking after a disabled provider who is unable to continue working. Protect your family and loved ones who depend on you by ensuring that if a worst case scenario ever became reality then there is a plan for survival. With the increase in income comes the ability to put money away for retirement or adding to savings. Start with methods such as IRA or 401k plans to take advantage of the tax benefits. Once this is obtained and after all other needs are met then there is an opportunity to invest in index funds or individual stocks. There Since most young physicians start working in their 30’s, take advantage of compounding returns for 30 plus years. There is a saying that time in the market beats timing the market. I mad the mistake of not taking advantage of Roth IRA when I was a resident. Now I am in a good position since I make above the maximum allowed to contribute to a Roth. This means that I need to take advantage of the backdoor Roth IRA. Bigger salaries mean the opportunity to donate larger sums of money or your time. I think its important to give back to your community or organizations. I have significantly increased my charitable contributions in the past 4 months. There were numerous people and groups that believed in me along my path to become a physician. In an effort to show my support I have donated back to some of these organizations and others close to my heart. Giving back doesn’t have to be hard or expensive. Sometimes donating your time is all people need. 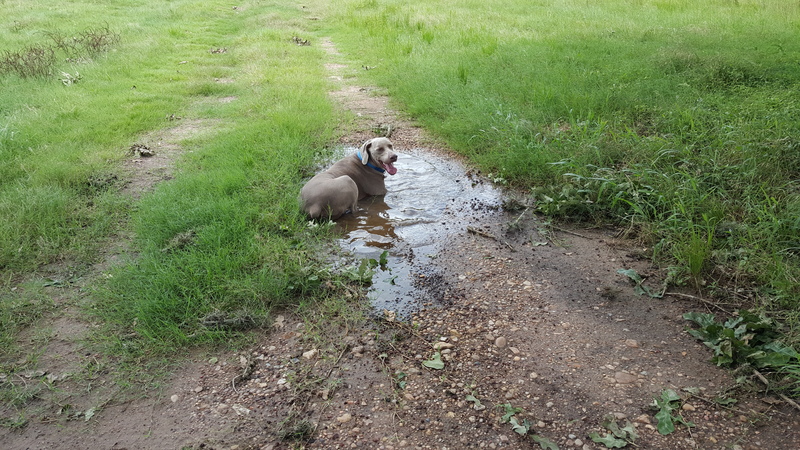 Duke cooling off in a puddle after a long walk.